My first game with a new deck in several months. I was playing with two guys I’d never played with before. I had a 3 land hand and played an early Petalmane Baku. Daretti played some myr and a Wanderer’s Twig, and Prossh went hunting for land. I played a Loam Dweller and a Traproot Kami and followed it up with a Kodama’s Reach into Jugan. Prossh played a baby dragon with a Pattern of Rebirth. Darretti was up to 9 counters, so we attacked him down. He responded with a Blaspehmous Act that killed off my team and left me with only 6 land… I had planned on using Petalmane mana to cast Sekki, instead I had to struggle to find lands. Prosh followed up with an Utvara Hellkite that got pretty crazy, and Daretti was making tons of baby Myr. I had a beefy Forgotten Ancient, and I had to take advantage of a Tempting Offer to get more land. Utvara Hellkite was pumping out more Dragons and there wasn’t much that could be done. I cast Sekki and made her 21/21 from forgotten ancient. I attacked just for fun, but died to an Earthquake. I got to cast Sekki, so it was fun. About the Deck: I was a bit inspired by reading a tiny bit of an article on Sekki (which I stopped reading so I didn’t get too many ideas) that pointed out the fact that Sekki makes spirits even if counters aren’t removed. I built it to be somewhat Spirit/Arcane tribal, with ways to pump up Sekki and lots of Fight cards to get damage dealt to Sekki. One thing that I forgot was that Kamigawa spirit tokens don’t fly. I started with 2 forests and drew into a Myriad Landscape, and play a few decent elves. Rhys started early with an Essence Warden, Skullclamp and other stuff into an early Kozilek, Horde of notion gets a 5-0 Fact or Fiction split, and Shauku wipes the board and uses Sorin to put Rhys down to 10. All of Shauku’s lands get destroyed and he scoops. Horde of Notions pounds me down to 1. Rhys tries some tricks, but Horde has a stupid Craterhoof Behemoth (or something like that) on a Hideaway land, and I can’t do math, and scoop. 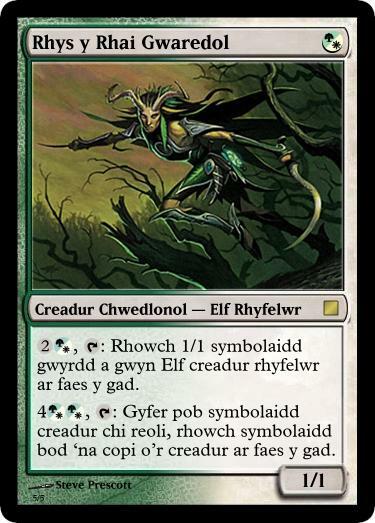 I started building another deck and ended up cutting the Elves from it and they ended up here. I didn’t want to play a dumb elf general, and I liked the idea of Freyalise as a non threatening value generator. I think there is a combo in there with -1/-1 counters. Kaysa is the alternate general for this deck because of her Rebecca Guay art. There seemed to be time for another game tonight, so I played the other Yasova deck I had built. This one is “Mono” Green. I started out with a Forest and Fertile Ground followed by a Beastmaster Ascension. Sisters played an early Steely Resolve choosing Gorgons (obviously). I swung with a Giant Solifuge to start ascending. I also got to play Hero’s Blade followed by Yasova. Sisters of Stone Death hit the table and ate Grimgrin’s Solemn Simulacrum. Knowing that my Yasova was probably going to die to either Grimgrin or Sisters, I sacrified her to a card draw spell to draw 7. I tried to cast a Realm Seekers, but it was countered (thankfully Grimgrin also countered SoSD’s Vraska attempt as well). I managed to steal a a Grave Titan, and I played an Engulfing Slagwurm as some anti-Sisters tech, but I couldn’t stabilize. Grimgrin played a Crypt Rats, wiped the board, and by then it was 9p.m., and we had to go. 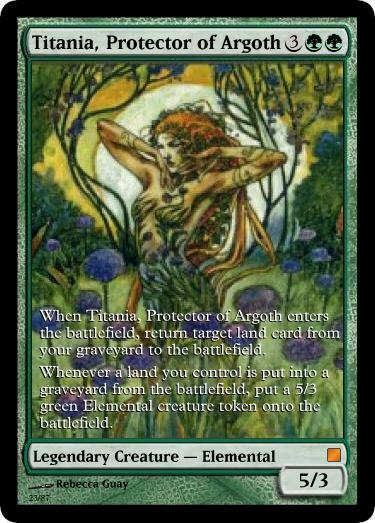 I play Lands on Turn 1-6, casting Titania turn 6 followed by a Crop Rotation for a token and a Ghost Quarter. On Turn 7 I can swing for 20 with Titania and 3 elementals. In the meantime Daretti has started building a Myr Army, Gisa has a 1000-year elixir, cryptghast and shepherd of Rot, and Grim Grin has killed things with a crypt rats. Zurgo has smashed a number of people. Turn 8 I swing elementals at Zurgo and Grimgrin. Turn 9 I swing at Grimgrin. Turn 10 I swing at Zurgo (though Gisa Duplicanted my Titania) Zurgo has blasted Daretti out of the Game early, so Gisa kills Zurgo out of the Game. GrimGrin has a Roil Elemental, but it dies to Gisa. I just keep drawing lands and Casting Constant Mists to try to keep Grimgrin and Myself alive, but I’m always one land short of being able to really do anything to re-mount an offense, and we get over-run by Gisa.